This close-up ranges from the northern edge of the 'Starfish' site, past the River Loddon to Shinfield and Lower Earley. 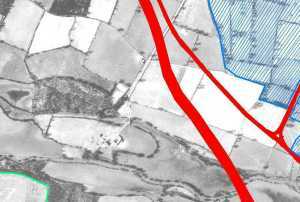 There's not a hint that this patchwork of fields would change so drastically within 40 years. The M4 was originally intended to pass from Maidenhead Thicket westwards through southern Oxfordshire, but the local residents put up such a fight that the route was revised in the late 1960's. The new line passed south of Reading, enclosing most of Lower Earley and forming the southern boundary of the conurbation around Reading. The cluster of buildings in the centre of the picture, just right of the woodland, is Rushey Mead, now part of the University of Reading. The lane is now cut off by the M4, and the only way to reach it is via Cutbush Lane, off the top left of the photo. 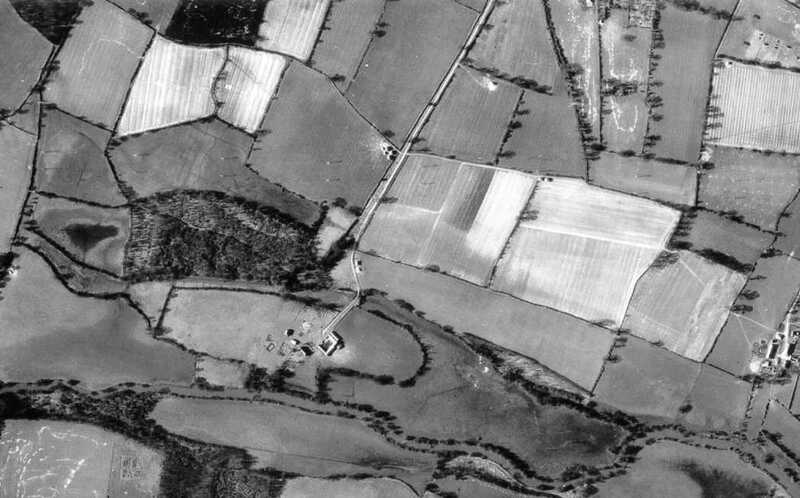 The motorway crosses the square field just above the buildings; on modern photo's, the top right-hand tip (the white patch of the field in 1944) can still be seen. The Earley Outer Peripheral Road just touches this corner. The M4 crosses the River Loddon at the point where two channels met in 1944; the river alignment seems to have been altered to fit the bridge structure, which has about 6 feet of clearance. The light-coloured field in the middle of the right-hand side of the photo marks the roundabout between the Outer Peripheral Road and Meldreth Way, one of the spine roads in Lower Earley. Another spine road is Chatteris Way, which just touches the top right corner of the large square light-coloured field. The other fields in the top right are now residential areas, from Adwell Drive and Lidstone Close to Fordham Way. The countryside is tantalisingly close, but it can only be reached via the old Cutbush Lane motorway bridge, now downgraded to a footpath.